Ah, those were the days. 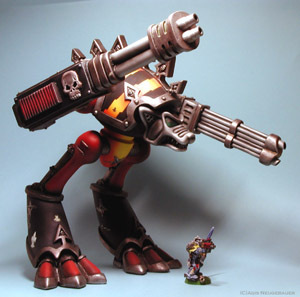 Forge World was not established, and the only source for 40K Titans was an American company named Armorcast. Don’t get me wrong, I like the stuff that Forge World is doing a lot, but the Armorcast resin castings had a certain, low level rustic charm. It was quite difficult to get there stuff here in Europe, but fortunately I was some times in the States for vacation. I still remember the time when I bought Titans for more then 1.000,00 $ for me an some friends back in Germany at Enterprise 1701 in Orlando. 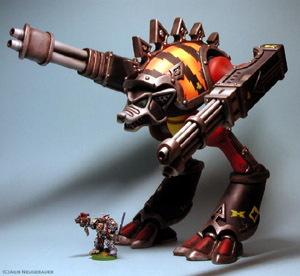 One of the first Titans I painted was the Warhound. I still like it. 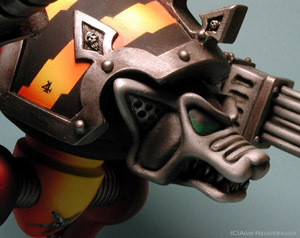 The small Wolf Lord is just for size comparison. 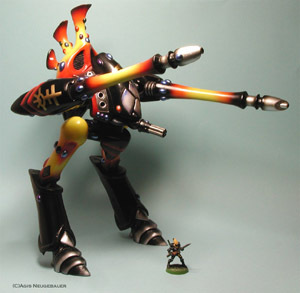 The second Titan was the Eldar Revenant Scout Titan. A great graceful design that cried for careful and clean painting. 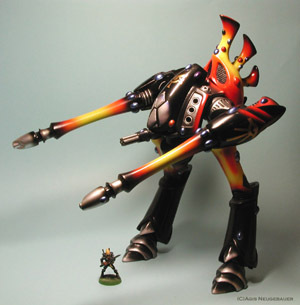 The Titans were a good excuse for me to get me an airbrush and a compressor! 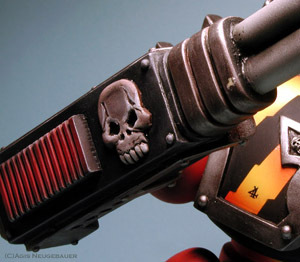 I used it quite a lot on the Revenant. Specially the masking of the golden runes were a real pain.